The toilet in your home has several tank components, but there are only two tank valves at work every time you flush the toilet: the flush valve, which releases the water stored in the tank down into the toilet bowl when you press the flush lever; and the fill valve (also traditionally known as a ballcock), which controls the water flow that refills the tank after the flush. While the flush valve rarely needs attention, it's quite common to make adjustments on the fill valve to ensure a proper flush. The fill valve has a float or other device that moves with the water level in the toilet tank, opening the fill valve after a flush and shutting off the valve when the tank is full. 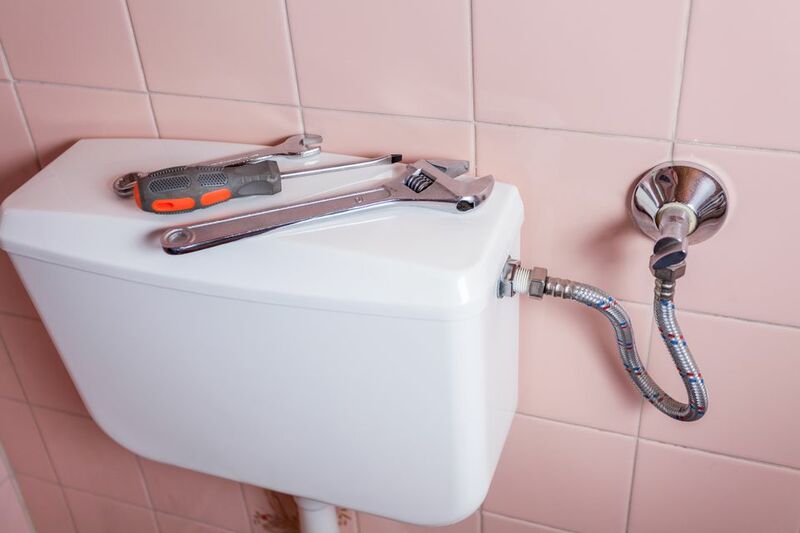 Adjustments to the fill valve may be needed when the toilet fails to flush completely, which usually occurs because there is not enough water in the tank, or if the valve is set too high and the water fails to shut off. Each type of fill valve has a method for adjusting the water level in the tank. Note: If your fill valve has a small rubber hose running into a brass or plastic overflow tube in the center of the tank, make sure the hose is directed down into the overflow tube and that the end of the hose is above the standing water level in the tank; it should not extend down into the overflow tube below the level of the tank water. Usually, there is a clip that holds the hose in the proper position at the top of the tube. 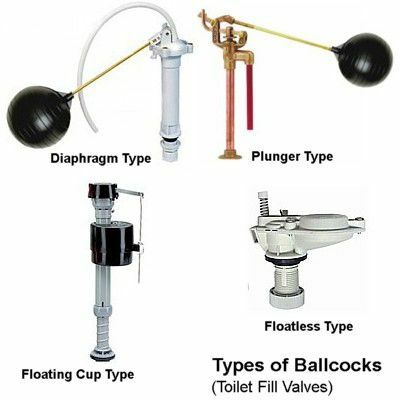 Plunger-fill valves are actuated by a floating ball attached to a brass float rod. The rod moves to activate a plunger or piston in the ballcock body to start and stop the flow of water to the tank. This is the design that is properly known as a ballcock. The plunger uses an O-ring or leather washer to form a seal to prevent the water from leaking out the top of the fill valve. To adjust the water level with a plunger ballcock, you simply bend the float rod gently upward to increase the water fill level in the tank, or bend it downward to lower the fill level. The water level must be below the top of the tank's overflow tube. A diaphragm ballcock is quite similar to the plunger-style, except that the valve itself does not use a plunger stem, but rather a diaphragm seal inside a round valve body. It also has a float rod and ball to control water discharge, making it a true ballcock. The lever assembly moves a plastic button in the top of the bonnet, which in turn presses against the rubber or plastic diaphragm to control the flow of water. As with the plunger ballcock, you adjust the water level by gently bending the brass float rod upward to increase the water fill level, or downward to lower the water fill level. The water level must be below the top of the tank's overflow tube. If the tank does not refill: Older models of the diaphragm fill valve have a bonnet or cap made of cast brass like the rest of the fill valve body, but the button that actuates the diaphragm is made of plastic. Sometimes calcium or other mineral deposits can build up between the brass bonnet and the plastic button, creating friction that causes the button to remain depressed in the “closed” position, even when the float road and ball have dropped away. When this happens, the toilet tank is drained empty and the ballcock does not release fill water to fill it back up. To fix this problem, spray some penetrating oil into the top of the bonnet where the plastic button protrudes through. Then, work the button up and down by manually moving the float rod up and down so as to depress the button a few times. The button should work free and the ballcock should then operate properly. This is the plastic version of older diaphragm ballcocks made of brass. In this case, the lever assembly moves a plastic button in the top of the bonnet, which in turn presses against the rubber or plastic diaphragm to control the flow of water. However, on newer plastic diaphragm ballcocks, there is an adjustment screw on the top that adjusts the height of the float rod and ball. Turning the screw counterclockwise raises the water level, while turning the screw clockwise lowers the water level. The water level must be below the top of the tank's overflow tube. The float-cup fill valve is the current standard. Water flow is controlled by a cylindrical plastic float that moves up and down along the fill valve shaft. This is sometimes called “floatless” because it doesn't have a traditional float rod and ball, but it does indeed use a float. The floating cup is attached by a metal spring clip to a thin metal rod that controls the fill valve. To adjust the water level, pinch both ends of the metal spring clip and raise or lower the float. To lower the water level, slide the float downward on the actuating rod, then release the spring clip; to raise the water level, slide the float upward on the rod, and release the clip. On some float cup valves, there is a plastic screw mechanism that you turn to raise or lower the float. In any case, the water level should be about 1 inch below the top of the overflow tube and the critical level mark on the fill valve. Floatless fill valves use a pressure-sensing mechanism rather than a float to adjust the water level in the toilet tank. The valve operates under water and can sense the water level based on pressure. To adjust this type of valve, you simply turn an adjustment screw located on the top of the valve. To raise the water level, turn the adjustment screw clockwise; to lower the water level, turn the screw counterclockwise. The water level must be below the top of the tank's overflow tube.